While the US is fighting ISIS intensively on the ground, some lawmakers also want Washington to take the battle online. One even proposed using internet memes, noting that the terrorist group has successfully used them to further its mission. 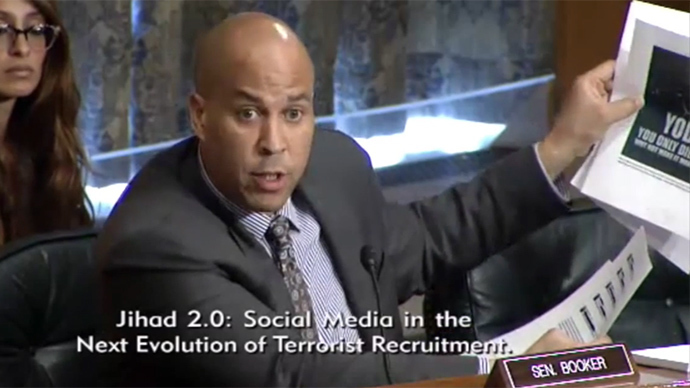 During a 'Jihad 2.0' hearing on social media and terrorism, the Senate Homeland Securities and Government Affairs Committee discovered that the Islamic State (IS, formerly ISIS/ISIL) has managed to attract the interest of 62 people in the US through social media. The interested online parties either tried to join IS (some successfully) or supported others in doing so. Of the 62 people, 53 were very active on social media, downloading jihadist propaganda. Some of them directly communicated with IS. But Sen. Ron Johnson (R-Wisc.) had just the answer to the problem – and it didn't involve deadly weapons or military troops. “Let’s face it: We invented the Internet. We invented the social network sites. We’ve got Hollywood. We’ve got the capabilities…to blow these guys out of the water from the standpoint of communications,” he said. He was supported by Sen. Cory Booker (D-N.J.), who had an unconventional trick up his sleeve: internet memes. “Look at their fancy memes compared to what we’re not doing,” Booker said while clutching print-outs of ISIS memes. A prolific user of Twitter, Booker said he knows “something about memes.” He became a viral sensation himself after rescuing his neighbor from a burning building in 2012. The hearing, titled 'Jihad 2.0: Social Media in the Next Evolution of Terrorist Recruitment,' is part of an ongoing attempt by Congress to identify ways to thwart efforts by overseas terrorists to lure foreign fighters or incite jihadists to commit attacks inside the US.